I really couldn’t wait to leave Gold Beach, and ahead of me was the most anticipated accommodation on the entire trip – spending the night in the Heceta Head Lighthouse keepers Victorian bed and breakfast. I was very excited. Little did I know that I would be spending the night with a ghost. Not just a bump in the night ghost, this one spent most of the night with me. But that story in a minute. 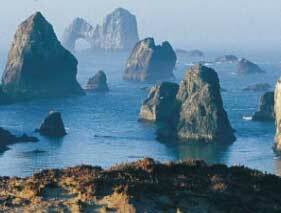 The southern Oregon coast is a well kept secret. If I had my way, I would retire in some little house on this coast and live out the rest of my days in beach combing bliss. I finally stopped for a full meal. Even a greasy spoon tastes wonderful when your staple has been PB&J sandwiches. I followed 101 both alongside the Pacific as well as inland, although with the trees blocking my view of the sea, sometimes it was hard to tell whether I was inland or not. I came upon Coos Bay Bridge, and what a marvel of engineering it is. As beautiful as it may be, like any other Californian I don’t like spending too much time either on or under a bridge. When you’ve lived in California for 50 years, unpleasant memories can pop up at the most inopportune times…remember the Oakland Nimitz Freeway collapse of 1989? Three levels of freeway reduced to one during rush hour? I do. Just sayin’. I had better get used to it though, Oregon has so much more water than Cali and the 101 will traverse many a bay, river, creek, and lake before I’m done. I pass Florence and the Sea Lion Cave. I had wanted to stop there, but the reviews were lukewarm so I passed. Heceta Head Lighthouse was in my sites, and only about a mile away. Please see Bucket List Value Added – A Ghost In My Room for a full account of this amazing place, the ghost that haunted me, and her suspected reason for doing so. The rest of this post will not make much sense without that reference I’m afraid. After my night with Rue (also known as the grey lady) I can count her as one of the fascinating women I encountered along the Pacific Coast Highway, even if she was invisible and terrifying. I took away far more than a ghost story from that night however. I was at total peace when I climbed back into my car the next day. I can’t say that the too tight twisted rubberband completely let go of the grief link, but I can say that it relaxed it’s grip on my soul. I’ll never be ok with my Sister and Daddy choosing suicide, but I felt the weight moving off of me, like taking off a dark heavy cloak for the first time in a long time. Rue also left me with a surprising truth. We who persevere, who wake every morning and no matter how hard the day may be we endure (I always feel guilty when I say that, it’s not like I’m being tortured in an Iraqi prison, but so much is relative I guess). We who cherish and hold onto the hope of good times to cushion us when we fall on the despair of bad times. For those of us who trust in God even when it seems like he is nowhere to be found…we get credit for time served. In the book of life it is noted that we lived our lives fully, we took the good with the bad and rode it out to the end. Our butterfly wings influenced the world in ways we will never know just because we kept flying. For those who sought to end their strife/grief/pain in taking their lives, I think there may be a harsh reckoning in that they didn’t end anything. The ultimate price, for what did they pay? At least in Rue’s case, she was here a hundred years before I got here and how many hundreds of years after I’m gone? There is tremendous merit in working through whatever it is that may be stealing our joy while we are still here on this beautiful Earth as mortals. When I left this unforgettably scenic and mystical place the next morning, I took much comfort in knowing that we have a choice in which path we take, and the hard road reaps the most rewards. I choose to stay and ride it out. Thank you for indulging my ramblings, and I hope that by now my dear readers know they are really my diary. Until next time. This entry was posted in Bucket List, Bucket List - Value Added, On Surviving, Road Trips, Travel and tagged Bucket List Adventures, Bucket List Travel, Bucket List Value Added, Dear Diary, haunted travel, Heceta Head Haunted House, Heceta Head Lighthouse Ghost, Pacific Coast Highway Ghost Story, Pacific Coast Highway Road Trip, Road Trip Adventures, Solo Road Trip, Surviving Suicide by ckdenson. Bookmark the permalink. We who persevere. We who cherish. We who choose to plow on, regardless. These resonate with this reader as truths. And groundings… not as anchors or tethers rather as foundational to who we are and how we survive, and thrive. How come I never encounter any Rue’s in my life? So well said Eric! I suspect you have many Rues in your life but if you want a ghostly one, just book a room at the Heceta Head Lighthouse bed and breakfast the next time you’re in that neighborhood. You’ll probably get a most memorable stay!